In 1960, after a long career as a teacher in the Bainbridge Island School district, Zoe Beal published a history of the schools she knew so well. 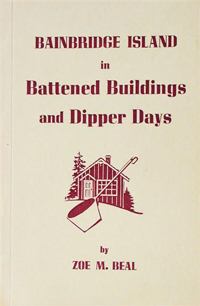 Her book, Bainbridge Island in Battened Buildings and Dipper Days (1960) uses official documents and eyewitness accounts to present a detailed picture of the ten schools that served the island during its early years. Beal describes the purpose of her book as "an attempt to recapture as true a picture as possible of the days of the one-room school house and its development through 1922 and 1923, the years of the formation of the single school district for the island." A copy of the book, found among the books donated to the Bainbridge Island Friends of the Library, was given to the Bainbridge Island Historical Society for its collection.